"These things hang on a thread. It could have ended differently." It all seemed like such a good idea at a time, the ultimate go picture: an original screenplay by one of America's finest playwrights, under the direction of one of the giants of Hollywood, and starring three of the most famous actors on the planet. But something�or a number of things, actually�went terribly wrong from conception to execution, and there's much about The Misfits that seems botched or awry. This documentary reflects back, forty years after the fact, with some of the surviving members of the team, and with the children of others, on just how things got off the rails. It's an abject lesson even today on the perils of big-budget filmmaking, and also serves as an elegy for the passing of a certain era of moviemaking in Hollywood. The Misfits may be most notable not as a work of art in its own right, but for the fact that it was the last film for not one but three of the brightest lights in the history of American film: Clark Gable, Montgomery Clift and Marilyn Monroe. Arthur Miller had been waiting out a divorce in Reno, and came to know some of the local cowboys, who spent their brutal days roping wild mustangs, to sell the horses off for dog food—their story became Miller's next project, a screenplay with a leading role tailored for his next wife, Monroe. John Huston signed on to direct; he had worked well with Monroe on The Asphalt Jungle, and, unlike others in the business, had high regard for her talent. A cast of any director's dreams was signed on to round out the project: not just Gable and Clift, but Thelma Ritter and Eli Wallach, too. All those good intentions soon evaporated under the desert sun, and as the project went under, so too did Miller's marriage to Monroe. Miller and Wallach are the two principal surviving members of the creative team, and new interview footage with them is especially revealing; also on camera is Huston's son Tony, and the wife and two sons of the late Frank Taylor, the film's producer. The documentary crew also visits with other members of the crew—the script supervisor, the assistant to the producer, and so on—and the portrait painted of the production is not a pretty one, full of recriminations and petty resentments, rewrites and reshoots, and lots and lots of going over budget. An army of photographers descended on Nevada for the shoot, and among them was Inge Morath, who speaks here quite poetically about Monroe's fragility; the point that, somewhat surprisingly, is never made explicitly here is that after Miller's divorce from Monroe, the playwright married Morath, and there's something both creepy and moving about the photographs by one Mrs. Arthur Miller of another. But unquestionably the villain of the piece is Paula Strasberg, Monroe's acting coach, who tyrannized the star as well as everyone on the set, from which eventually she was banned. Recollecting painful memories is always difficult, and must be even more so for people whose lives are so public; add to that the fact that the stories being recounted are over forty years old, and it's hard not to believe that some sort of nostalgia is creeping in, playing a little fast and loose with the truth. But at less than an hour, this documentary makes for a fascinating companion piece to the feature film. Image Transfer Review: Originally produced for television, the film looks just fine on DVD, with a respectable transfer; the new interview footage is shot with particular flair. 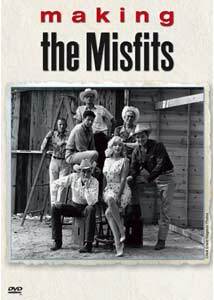 Clips from The Misfits are, happily, presented in letterboxed format. Audio Transfer Review: Audio transfer is competent if unexceptional; some of the archival footage has suffered particularly over the years, and you can hear that more than you can see it. Extras Review: Chapter stops are the only extras on the disc. This doesn't quite rise to the level of something like Burden of Dreams or Hearts of Darkness, but it's an entertaining and informative look at one of the most fascinating (if not the most successful) movies of the postwar years.